We've been ordering these for years now. We always customize them just the way we want. Thank you Custom Earth Promos. Love these wish kits. Great business idea. Great company to do business with. Thanks CEP. Great product. 100% recycled and bio-degradable. Beautiful! The kit is recycled and bio-degradable. Love these wish kits! Such a great idea! Been ordering them nonstop ever since my first order! Great company! I like the fact that there are actually seeds in the paper and that its some false advertising ploy. Thanks for the service Custom Earth Promos. I have been getting a great response from customers about these wish kits. We customized these seed paper wish kit for my family reunion. Everyone thought they were the best idea. We can think about each other every time we see the bloomed flowers. I was very impressed with the outcome after it was planted after the amazing initial use. One of the best ways to be remembered and stay relevant. These seed paper wish kits really allow you to do both. Great coloring options, and Eco-friendly. We hand these seed paper wish kits at all our venues. We always get great feedback and continuously more business. I customized these seed paper wish kits for all our company functions. I felt like it was a great way to gain some exposure, and be eco-friendly while doing it. I got some great suggestions from the fine people at Custom Earth Promos. Thank you for helping me to complete my order. I liked the letterpress print better because it didn't hurt the integrity of the seeds. I wasn't sure if the seed paper would actually germinate, I was pleasantly surprised when the flowers bloomed in my garden. Great plant selection. I can't wait to see how well these work. I like the letterpress printing style. Looks really good. Bring the hopes and dreams of your employees, customers or guests to life with Seed Paper Wish Kits from Custom Earth Promos. Your custom designed wish kits will include a custom-printed package, 12 2.6" seed paper circles, and a pencil. Orders of over 500 wish kits include custom-printed pencils. You'll work directly with one of our in-house design experts to build a custom design from scratch that best captures your brand, event or campaign. 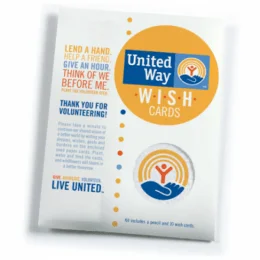 We will customize the wish kit packages to vividly display the brand name, logo, witty slogans, facts or environmental initiatives of your campaign. Use wish kits as a team building exercise and morale booster for a company event or mail out. Customize wish kits to promote a specific eco-friendly ad campaign. Mail wish kits to your VIP customers as an incentive for their loyal business. There are so many ways to use Seed Paper Wish Kits to engage your audience and strengthen the eco-responsibility of your brand image. Encourage your audience to write their hopes and dreams on the 12 included seed paper circles, plant them under a thin layer of soil and water daily. With our top germinating seed paper, the wildflowers of their dreams are guaranteed to sprout in just 1-3 weeks. Seed Paper Wish Kits are an inspiring and effective way to strengthen the social and environmental significance of your brand. Consumers are placing more brand trust and purchasing decisions in the positive impacts being made by the brands competing for their business. The trend towards sustainability provides brands serving all sectors a great opportunity to grow their "green" presence. As more and more businesses are employing eco-ethical initiatives, the window of opportunity to establish your brand as eco-friendly won't be open for long. Invest in the future success of your brand. Promote your sustainable strategies and eco-ethical practices with our affordably-priced and eco-optimized wish kits. Seed Paper Wish Kits are guaranteed to leave a valuable, lasting impression with the customers, employees or event attendees they are given to. Secure brand trust, loyalty and increased market share value by promoting the ethical core of your business. Our wish kits provide a unique ability to promote both your social and environmental commitments with one creative product. With recycled, recyclable and biodegradable materials that grow into living representations of their dreams, wish kits are the perfect eco-friendly promotion to build brand loyalty among your customers. Publicize the positive social and environmental initiatives of your brand with an exclusive order of custom designed Seed Paper Wish Kits. You'll work directly with a member of our in-house expert design team, defining the customization options that will best capture your brand aesthetic or drive a current campaign. We use only the best printing technology to ensure that your designs are replicated beautifully. Our proprietary inkjet printer sprays ink uniformly to ensure that the entire sheet is evenly colored while maintaining the high germination rate of the embedded seeds. A virtual proof of your design will be provided for you to approve, guaranteeing each customization has been appropriately selected and accurately captures your desired aesthetic. We'll build a custom design for your Seed Paper Wish Kits' packaging, seed paper circles, and pencils for orders of 500 Seed Paper Wish Kits or more, using the specific printing techniques and graphic imprints your approved order blueprint calls for. The Letterpress printing option embosses your brand logo on a custom design of high-quality seed paper, lending an elegant and unforgettable charm. We also offer offset printing for high-volume and/or low-budget orders. However, this should ideally be the last option as this technique affects the germination rate of the seeds. We can also infuse your paper with a specific seed mix of Zinnias, Daisies, Sage, Parsley, Basil, Carrots or a plethora of other herbs, vegetables, flowers, and grasses. Be sure to ask about the custom mixes available for your order!